1. 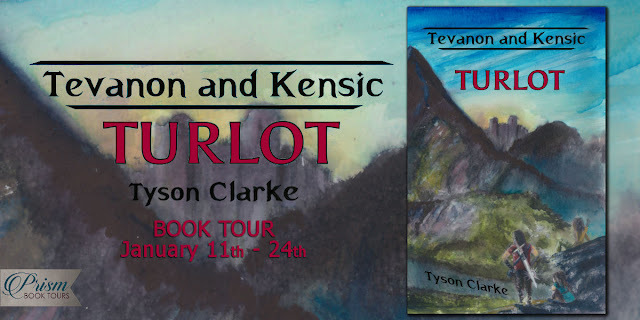 What is your motivation behind Tevanon and Kensic: Turlot? Why did you want to write it? I wrote a short story about these characters when I was in college, back in 1995, and then converted it to a short (film) screenplay. Tevanon and Kensic were adults in those versions, but I always thought it would make a cool young adult adventure if the brothers were younger. And so, nearly twenty years later I rewrote it into a novel in that vision. I may be somewhat bias, but I think I was right; it does make for a cool young adult adventure! Avor, Wix and Hedik surveyed the dead brigands in hopes of finding one of them alive so as they could question him. As they meandered through the scattered bodies, they found men from every nation, men of light skin and dark, short of stature and tall, and the weapons they carried were equally assorted. The question, of course, was what brought together this reckless collection of thugs and criminals? What was their purpose? "The characters are easy to visualize. The various scenes are portrayed well. The Book Cover is attractive, depicting the crux of the story, and the title fits very well." Deep within the haunted caverns of Dezvil, well beyond the jurisdiction of men, there was said to be the sacred place of the sorcerers who ruled the land thousands of years ago. No living person dared journey to this place, not without the protection of a powerful spell cast by a powerful sorcerer. But all of the powerful sorcerers had vanished, either killed or too old to live, and not one of them had yet found the pathway back to the living. Or so was thought, until now. "The exploit in this story is fun, as well as has many engaging and like-able characters. This story has a bit of violence, but is not overly graphic, but I would recommend it older teen readers." "Being an adult who read it, I enjoyed it more than I thought I would and would recommend it! It would be a great book for young male readers and I think female readers can enjoy it as well!" Tevanon drew his sword at the man’s first word. He could see the vague outline of a person sitting against one of the twisted trees. He didn’t appear threatening, but Tevanon was taught to error on the side of caution. Tevanon shrugged as a woman darted out from the darkness. Her dress was torn and tattered, her hair unbound and tangled, and mud was splattered across her legs and bare feet. She met eyes with Tevanon. “Help me, please!” Her cry was desperate. Both Tevanon and Kensic knew what that meant. It meant the members of the Elite Guard of Detoa had been hijacked and the jewel stolen. Disappointed by this unexpected news, the brothers found a nearby inn where they could stay for the night. The main entry led to a dimly lit common area with various tables set around a large circular hearth. It was a place for eating and drinking and being merry. On this afternoon, though, being merry was not part of anyone’s demeanor. Upon the shores of the Laughley Sea, in the shadows of the jagged Northland Mountains and not so far south as the blistering Aronee Desert, there exists a land of lush forests and golden plains. This land is known as Lynsid, a once great nation that has suffered through more than a decade of demoralizing wars. The brothers Tevanon and Kensic were born to Lynsid like their parents and grandparents before them. They know no other life and have never been outside the borders of their homeland. Lynsid, however, is on the verge of collapse and rumors of a Vlagen invasion spur a mass migration. 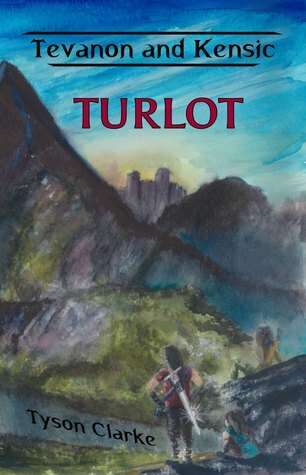 At first, the brothers have no intention of leaving their birthplace, but soon enough they have no choice and find themselves on the trail to a land called Turlot where their Great Uncle Welksley resides. At just thirteen-years-old, Tevanon is already highly skilled in swordsmanship, and his nine-year-old brother Kensic is mentally gifted. These attributes are useful, but the journey to Turlot will test not only their brawn and brains, but also their faith and tactfulness. The brothers learn quickly the world is filled with endless adversity. Treachery is in plain sight, evil sorcery is silently stirring, and an immortal army is lying in wait! If the brothers wish to survive, they must be vigilant, they must be brave, and they must believe in themselves. Tyson Clarke attended San Jose State University where he studied creative writing and film production. Post graduation, he found success as a technical writer then pursued other interests before rediscovering his passion for writing stories with encouragement from his wife and biggest fan. Discover your own personal princess story. This inspiring book helps you see your divine potential, recognize your inner princess, and learn how the plan of happiness is just like a fairy tale. Perfect for young women, moms, leaders, and princesses of all ages, this is an enchanting read that will guide you on the path to your own happily ever after. Jaci Green Wightman is most comfortable in her role as a wife and fulltime mother of seven children. In 2012, she earned a degree in University Studies from BYU-Idaho, 21 years after postponing her schooling to start a family. In addition to writing, Jaci loves to read, exercise, travel, and spend time with her husband and children. A video presentation of "Your Happily Ever After" by Dieter F. Uchtdorf, Second Counselor in the First Presidency in the April 2010 General Young Women Conference illustrating the points of his talk, Your Happily Ever After, with clips from films in the Disney Princess franchise. ​A Princess Story, the Real-Life Fairy Tale Founded in the Gospel of Jesus Christ, is a book women and young women of all ages will thoroughly enjoy. It is a book that will inspire and remind women and girls alike who we really are and what our potential is if we follow God’s plan for us and strive to do and be the best we can. This book shares teachings from the Prophets of the Church of Jesus Christ of Latter-day Saints, as well as refers readers to the scriptures that readers can use in their every day life. The enjoyable interactive, thought-provoking section at the end of each chapter will benefit readers as well. January 24: The Hand That Rocks the Cradle • J and A & Co.
​Tevanon and Kensic: Turlot, written by Tyson Clarke, is about two brothers whose family was killed during an invasion of their homeland and their adventure as they travel across the war-torn continent to find their Uncle Welksley in Turlot. The exploit in this story is fun, as well as has many engaging and like-able characters. This story has a bit of violence, but is not overly graphic, but I would recommend it older teen readers. A review copy of this book was provided via Prism Book Tours. J.C. Morrows’ book two in the Order of the MoonStone series, A Treacherous Decision, is a captivating story filled with mystery and adventure that readers will thoroughly enjoy! Filled with action and romance in a world of fantasy, this book is a great edition to a great series. With great characters and an engaging storyline, readers will fall in love with book from page one. I recommend this to teen readers that enjoy fantasy and action novels. Chancing a closer look, I placed one foot on a packed-dirt floor of the kitchen. My other foot followed. I looked back at Cinderella - I mean Gabriella - who watched from the other side of the miraculous door. Behind her, I could still see the sacks of boxes in my grandmother's attic. Gazing into reality while standing in a fantasy was a pretty weird sensation. Then, without warning, the door began to close. I scrambled to grab it, but something seemed to force it shut. Perhaps Gabriella, the supposedly sweet angel, had closed the door herself. Tarrah Montgomery has loved writing stories since she was a child. She earned her associates degree from Ricks College and her bachelor of science in education from Utah State University. Tarrah currently lives in Snowflake, Arizona, with her husband and young children. She loves to travel with her husband, and many of her story ideas come from seeing the ancient castles and architecture around the world. Some of her adventures have taken her to Paris, London, Rome, German, Austira, Switerland, Czech Republic, South Korea, and Thailand. When not writing, Tarrah teaches preschool and enjoys reading, traveling, spending time with her family, an playing the piano. I’m Not Cinderella is her first novel, with several more to follow in The Princess Chronicles. Check out the upcoming sequals on her blog (link below). Tarrah loves to hear from her readers, and you can contact her at tarrahmont[at]gmail[dot]com. What more can a teen ask for than a Cinderella story with a twist? In her first novel in the Princess Chronicles, I’m Not Cinderella, author Tarrah Montgomery brings to life an enchanting fairytale lover’s dream in her time-traveling, exciting, and brilliant re-told spin on the story of Cinderella. Filled with enchanting and engaging characters and a charmingly wonderful story, readers will fall in love with I’m Not Cinderella from page one. This thrilling story is not one readers will want to miss. Fast-paced, light, entertaining, and funny, I highly recommend this books to any teen that loves science fiction and fairytales. Continue this charming series in the next installment, Finding Sleeping Beauty. A review copy of this book was provided by the author via the publisher.